Simply put, Documentelligence is the process of making a document intelligent. An intelligent document, or better known as a “document intelligence” is our way of creating a smart office, through hardware, software, IT, Document Management and back-file scanning. Everything we do at Copier Fax Business Technologies falls under the umbrella of our exclusive process called Documentelligence™. Documentelligence™ was created to give a full review and customized solution to convert your office to a “smart office.” Our end goal is simple: Improve productivity, dramatically reduce wasteful spending, lower overhead costs, improve document security, and utilize modern hardware and software to create business automation. Documentellignece is combining the words, “document intelligent”, because that is exactly what we are doing. Every document can some way, shape or form can become “document intelligent” through Documentelligence. Hardware: We are the largest and historically longest Konica Minolta Dealer in Western New York. Documentelligence™ can work with your hardware system to capture, store, retrieve, print and protect your documents. You will get the best office hardware that fits your budget, and workflow needs. Software: From being used as a mobile platform to create apps for your office, or creating programs that allow immediate access to all data, anytime, anywhere; our software solutions give you endless possibilities with with your digital files. Ultimately, our software is meant to improve your workflow, and help you digitize your document management. Document Management: CFBT has an entire department dedicated to successful backfile scanning projects. Backfile scanning converts all of your paper documents into digital documents, clearing out space, and protecting your documents for eternity. Once every document is digitized, we can either safely and permanently discard your paper files, or return them to you in their original boxes. IT Services: Documentelligence™ acts as your outsourced IT company. We can monitor workstations and servers 24-hours a day, automatically fixing any problems. We believe in being proactive, versus reactive when it comes to your office servers, helping to reduce problems, and any “our computers are down” issues. 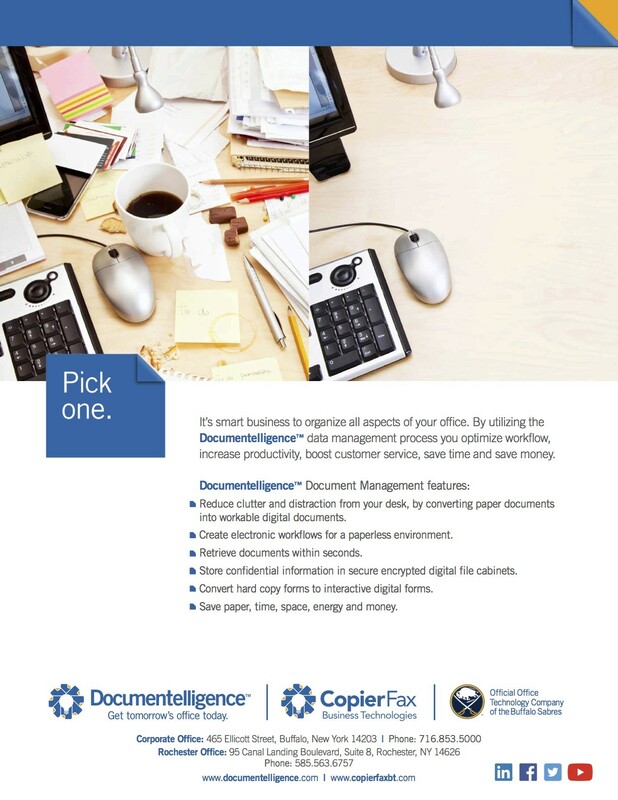 Any and all of these services provided through Copier Fax Business Technologies’ Documentelligence™ are designed to help you be Documentelligent – with increased productivity, optimized space, document management and protection and improved cost savings. This business automation will help you focus your time and energy on your actual business – instead of the hardware and software behind the scenes! To learn more about how Documentelligence™ can improve your office, call us today to speak with a Documentelligence™ solutions specialist.